The Dead Sea Scrolls date from the 8th century to the 11th century. The Dead Sea Scrolls were found in the Qumran Caves. 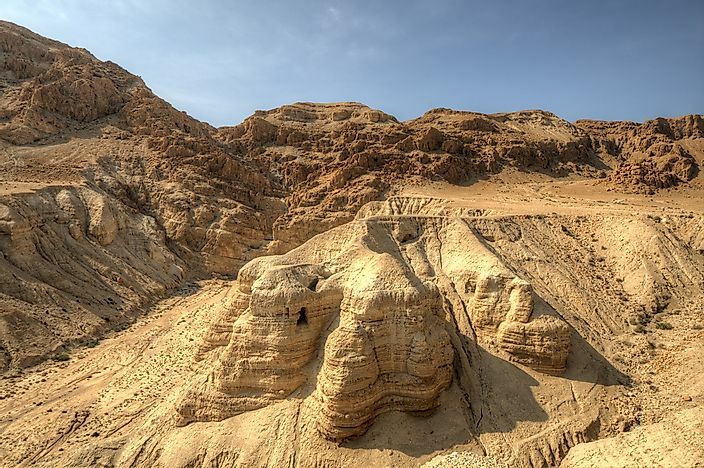 Also called Qumran Cave scrolls, Dead Sea Scrolls are found near the Dead Sea in the Qumran Caves. They are old Jewish religious manuscripts, mostly Hebrew. From 1946 to 1956, researchers discovered many written fragments which represent parts of larger manuscripts destroyed through human interference or by natural causes. The Dead Sea scrolls were dated from the 8th century to the 11th century and constitute manuscripts of other Judaean sites. The fragments have great religious, linguistic and historical significance. The texts are written in Hebrew, Aramaic and Greek. They are written on papyrus, parchment and copper. The texts which are identified fall into three groups: 40% are copies from Hebrew Scriptures, 30% are from the Second Temple period, and 30% are sectarian manuscripts. The caves are found at Khirbet Qumran in the Judaean Desert and west of the Northwest shore of the Dead Sea; where their name is derived from. The Dead Sea scrolls were unearthed around Wadi Qumran in a chain of twelve caves, near the Dead Sea in the West Bank between 1946 and 1956. The first scrolls were discovered between 1946 and 1947 by Bedouin shepherds. They found seven scrolls in jars in a cave near Qumran site. The scrolls caught the attention of Dr. John C. Trevor of the American Schools of Oriental Research in 1947. He compared them with that of Nash Papyrus and discovered some similarities with this oldest biblical manuscript. The head of the ASOR announced the discovery of the scrolls on 11th April 1948 in a press release. Cave 1 was rediscovered by Arab Legion Captain and Belgian United Nations observer in January 1949, prompting the excavation of the site. The caves were found to hold linen cloth, artifacts, jars, and additional Dead Sea Scrolls. A team from ASOR led by Roland de Vaux fully excavated Qumran and by February 1952, 30 fragments were discovered in cave 2. This yielded 300 fragments from 33 manuscripts. Cave 3 had fragments of Copper Scroll and Jubilee and was discovered by ASOR team which managed to discover caves 4, 5 and 6. The search accelerated because of their high monetary value and historical significance. Cave 11, which was discovered in 1956,yielded the last fragments in the vicinity of Qumran. In February 2017, a 12th cave was discovered by Hebrew University archaeologists. However, it appears as though the cave had been raided in the 1950’s since it had a blank parchment in a jar, empty and broken jars, and pickaxes.